1. More impressive from Game 1: the Clippers winning by 20 whilst only taking 17 threes (and making 6) for the game or Blake’s general LIFT? 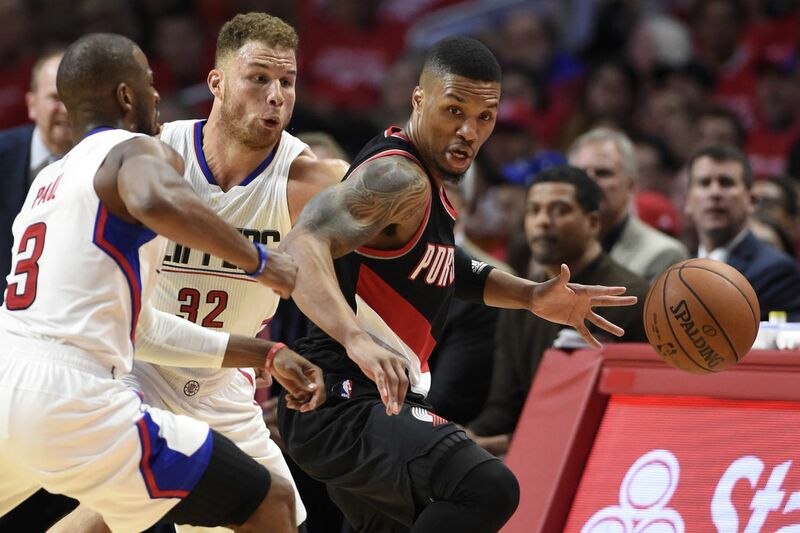 Law Murray (@LawMurrayTheNU): Blake Griffin’s athleticism from Game 1 was a major key. It was great to see a team score 50 points in a half whilst taking (and missing) only two three-pointers. Instead of wasting possessions forcing threes, the Clippers put Griffin in position to dominate physically. While you focus on threes, I’ll focus on free throws – and Griffin made 9-of-12 for the game, including 7-of-9 in the first half. Griffin hadn’t shot that many FTs in a game since December 2 (16 games played). Michael Shagrin (@mshaggy): The contrarian embrace of the mid-range. En vogue NBA strategy moves in cycles that open up new exploitable opportunities with each new league wide trend. While the three point shot was once under-appreciated, now it is not and defenses have shifted their focus accordingly. That strategic shift, embraced by Portland in Game 1, leaves wide swaths of open mid-range terrain. The Clippers recognized this and moved a lot of their interesting actions a few feet in, especially for J.J. Redick. During the regular season, he put up roughly 12 shots per game, half of which were threes. In Game 1, he shot the ball 12 times, but only 3 came from behind the arc. Kudos to Doc Rivers. Roscoe Whalan (@RoscoeWhalan): The two probably go hand-in-hand but Blake rising up with that left-hand again was dope. Herein lies what makes the Clippers a dangerous entity when Blake Griffin is in the line-up: they can kill you from beyond the arc when the likes of J.J., Jamal and CP3 get hot (Hell, even Lil’ Rivers can fire up the long-range cannon from time to time) but regardless, they’re still a threat and that opens up room for #32 down low who can destroy you inside. 2. Is the key to the Clippers’ success on defense as simple as “Double Dame”? Murray: The main key for the Clippers is ending the possessions. The Trail Blazers do two things exceptionally well on offense: shoot threes and rebound. Yes, there are still teams reliant on offensive rebounding. Because the Trail Blazers don’t force turnovers (they’ve had a negative turnover differential every year with head coach Terry Stotts and PG Damian Lillard), they need to retain as many possessions as possible. So while blitzing Lillard has been a mostly successful strategy for the Clippers against Portland, the blowouts come when Lillard and the Blazers don’t get second-chance opportunities. Shagrin: To a degree, yes. Damian Lillard is Portland’s primary offensive engine and the Clippers put themselves in a good position to win if they force someone else to make shots. During the second half of Game 1, the Clippers trapped aggressively and rotated with purpose. While the help defense was not pretty, it was functional–Lillard had to share the ball with less than capable shooters like Al-Farouq Aminu. He got a lot of wide open looks, but the Clippers are in good shape if the game comes down to the long range accuracy of guys like Aminu and Gerald Henderson. Not to get ahead of ourselves, but if the Clippers don’t tighten up their rotations before the second round, uncontested shots for Golden State’s secondary and tertiary options won’t be nearly as forgiving. Whalan: It’s part of it. The “Double Dame” strategy certainly worked in the sense that it’s cutting off the head of the snake. Historically, showing high on Lillard and doubling him has worked wonders for the Clippers. He’s clearly used to the approach but Game 1 was a particularly strong effort. Lillard admitted as much. The other part of it is as Law suggests — limiting second chance opportunities, and, as Michael aptly suggested: forcing guys like Al-Farouq Aminu to beat you probably is part of the reason this Blazers squad shot just 33% from deep in Game 1. 3. How do you anticipate the Blazers to adjust in Game 2? Murray: More C.J. McCollum, more Al-Farouq Aminu. Those two are the only other starters who average double-figures. McCollum in particular had only nine points on 11 shots in Game 1. His rival, Clippers guard Austin Rivers, had 11 points on 10 shots in 20 fewer minutes. Aminu will need to hit the open shots he missed in Game 1 – but mind you, the Clippers have adjustments to make as well. They can make Aminu’s looks tougher. There are two teams playing. Both can be better Wednesday night. Shagrin: Terry Stotts said he would play Damian Lillard off the ball more, likely to take advantage of the Clippers less than robust rotations. That should be interesting since Blazers offense will likely start with C.J. McCollum, who isn’t really known for his ability to create for others. Then again we haven’t seen Stotts give McCollum that responsibility all too often. It’s usually Lillard’s job. But this is what makes the playoffs great! Coaches need to carefully calibrate their strategic approach. Do you prioritize to the comforts of familiarity or the benefits of novelty? Whalan: There’ll be adjustments but, at the same time, there’s not a lot of different things this Blazers team can do. If they’re going to win the series the Blazers will need the dynamic duo of Lillard and McCollum to fire. Some other shooters will have to make shots too but I expect the Blazers to continue to roll the dice on the idea that Dame and C.J. will light it up at some point — particularly in Game 2, where there’s nothing to lose. I'm expecting another blowout. Portland is weak at center and that's a big plus for the Clippers. The Clippers have trouble against teams that are strong at center. They're lucky they didn't have to play Memphis with Gasol or Houston with Howard. Both of those teams give the Clippers a lot of trouble and it's because of the center position. But that's not a problem with Portland. Maybe in game 3 or 4, when Portland is at home, their guards will get hot and they will win a game or two.